President Barack Obama’s visit to Alaska this week, aimed at highlighting his push to fight climate change, comes just two weeks after his administration approved drilling for oil in the Arctic Ocean. Some Alaskan environmentalists see a disconnect between the president’s rhetoric and his actions on climate change. The Obama administration hopes the Alaska trip—Obama arrives in Anchorage Monday afternoon—will help sell the president’s proposals to rein in America’s greenhouse gas emissions. The president’s Alaska agenda includes seeing the rapidly retreating Exit Glacier near Seward and meeting some of the rural Alaskans hit hardest by climate change in Dillingham and Kotzebue. “The changes that we have been seeing over time seem to have accelerated,” Northwest Arctic Borough mayor and former Democratic state legislator Reggie Joule said on Thursday in Kotzebue. Obama is scheduled to fly there on Wednesday. The Native village of Kivalina—at the western edge of a borough bigger than Indiana—has been seeking funding for more than a decade to relocate before it gets washed into the Arctic Ocean. Even where the hazards from fossil fuel use are stark, Joule said the economic benefits are great. State government in Alaska runs mostly on oil taxes. “It is a conundrum for us because we are feeling the effects of a global activity,” Joule said. With Alaska’s icy landscapes melting and villages eroding into the sea, few Alaskans deny that the climate is changing any more. They do question how big a priority fighting it should be. “Climate change is a reality. The shipping lanes coming over the northern sea route [crossing the Arctic Ocean] are already open,” Port of Dutch Harbor director Peggy McLaughlin said. The closest deep-water port to the U.S. Arctic, Dutch Harbor is a staging area for Shell Oil’s 31-boat Arctic fleet this summer. McLaughlin said the United States is not the only nation drilling in the Arctic Ocean. The state’s entire Congressional delegation has been urging President Obama to learn about Alaskan issues other than climate change while he’s in the far North. Republican Sen. Lisa Murkowski said she’s looking forward to welcoming the Democratic president on his first official trip to Alaska. “I think it is somewhat disappointing, though, that he apparently intends to use this as nothing more than a backdrop for climate change,” Murkowski said. Republican Rep. Don Young issued a statement suggesting Obama “give that stump speech from somewhere else” if he was simply coming to Alaska to promote his environmental platform. You might think Alaskan environmental groups would be cheering the president’s climate-themed visit. Instead, the groups most focused on climate change are organizing a protest rally. They argue President Obama can’t claim to be a climate leader after his administration gave the green light to Shell Oil to drill in the Arctic Ocean. Global diplomats including Secretary of State John Kerry are meeting in Anchorage to discuss the rapidly changing Arctic, and Obama is scheduled to join them Monday. Negotiators have been trying to put the brakes on global warming for years, with little success. While emissions reductions have been elusive, they have settled on a goal of allowing no more than two degrees Celsius of warming this century. A study by energy researchers this year in the journal Nature found that goal requires leaving most fossil fuels in the ground. “The results indicate that all of the Arctic resources should be classified as unburnable,” lead author and energy modeler Christophe McGlade from University College London said. In theory, according to McGlade, you could burn Arctic Ocean oil and avoid dangerous levels of climate pollution, but that would require the rest of the world not to burn any of its oil. That scenario is extremely unlikely, not least because conventional oil is cheaper to produce than drilling beneath the remote and icy Arctic Ocean. If geologists’ forecasts are correct, there’s enough oil and gas under the Arctic Ocean to give a big boost to global energy supplies—and to global concentrations of carbon dioxide in the atmosphere. The White House has pushed back against environmental groups’ accusations of climate hypocrisy. 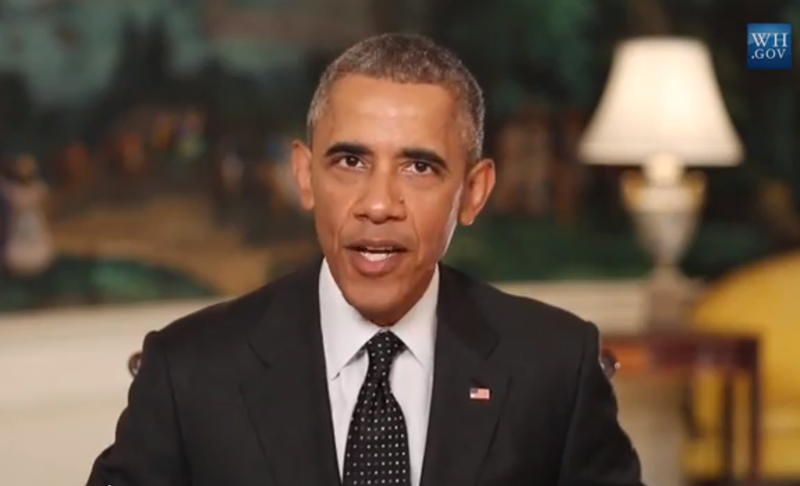 In the president’s weekly address on Saturday, Obama defended his support for Arctic offshore drilling. He said the United States was leading the world’s transition away from dirty energy sources. On Aug. 3, the White House unveiled its Clean Power Plan, with Obama calling it “the biggest, most important step we’ve ever takento combat climate change.” The administration estimated its plan will reduce CO2 emissions from power plants by 870 million metric tons. Yet the administration’s approval of Arctic drilling could wipe out any savings in pollution from that plan many times over, according to Lois Epstein with the Wilderness Society in Anchorage. Using Obama administration figures for the amount of technically recoverable conventional oil in the Chukchi and Beaufort seas, Epstein has calculated that using all that oil would generate 10 billion metric tons of CO2—15 times more than the clean power plan would save. She said that much pollution would be enough to increase the CO2in the global atmosphere by another 1.3 parts per million. Concentrations of CO2 in the earth’s atmosphere are currently at 401 parts per million, their highest in at least 800,000 years. Burning of fossil fuels and deforestation drive CO2 concentrations up another 2 parts per million each year, according to the National Oceanic and Atmospheric Administration.